The very severe cyclonic storm has weakened into a cyclonic storm post crossing coast and is now over Chhattisgrah and adjoining South Odisha. Presently, negligible rain and calm winds are being experienced at Visakhapatnam. However, occasional rainfall activity with associated winds gusting upto 30-40 Kmph may be experienced in and around Visakhapatnam till midnight 13 Oct 14. The Defence Crisis Management Group has nominated Indian Navy as the lead service for conduct of rescue and relief operations in Andhra Pradesh and Odisha, and the operation has been codenamed as OP LEHAR. 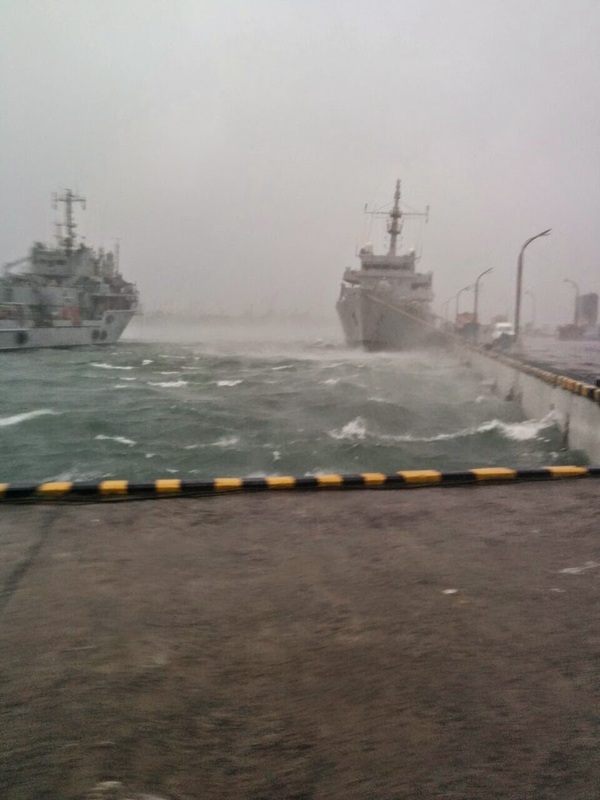 Eastern Naval Command has indicated readiness in all respects for providing assistance for relief operations. Indian Naval Ships Ranjit, Shivalik, Shakti and Airavat are ready to sail with relief material for 5000 personnel. Additionally, four more ships have been kept ready for sailing at short notice for relief operations. Approximately 24 diving teams have been deployed in and around Vizag for relief operations. One P8I ex-Rajali and one Dornier ex-Dega have been launched at about 1100hrs on 13 Oct 14 to undertake damage assessment. Based on the damage assessment, IN assets will be deployed for rescue and relief operations to best effect. In addition to the above preparation, the officers and men of the naval base at Vishakhapatnam are working to get base back to its operational status at the earliest. Damage in the Naval Dockyard was minimised by the proactive and preventive measures undertaken by all concerned. The airfield at INS Dega was flooded and damaged has been reported to almost all buildings. With sustained efforts, both runways have been made fit for flying operations w.e.f forenoon 13 Oct 2014. Approx 60% trees have been uprooted in the Naval Area and almost all roads are blocked due to these. Power supply to the base has been disrupted due to damage to transmission lines and communications have been severely affected as BSNL lines, Rukmani and INMARSAT are not operational. Communication with Maritime Operations Centre (MOC), Vishakhapatnam has been established with Communication Centre, Delhi. 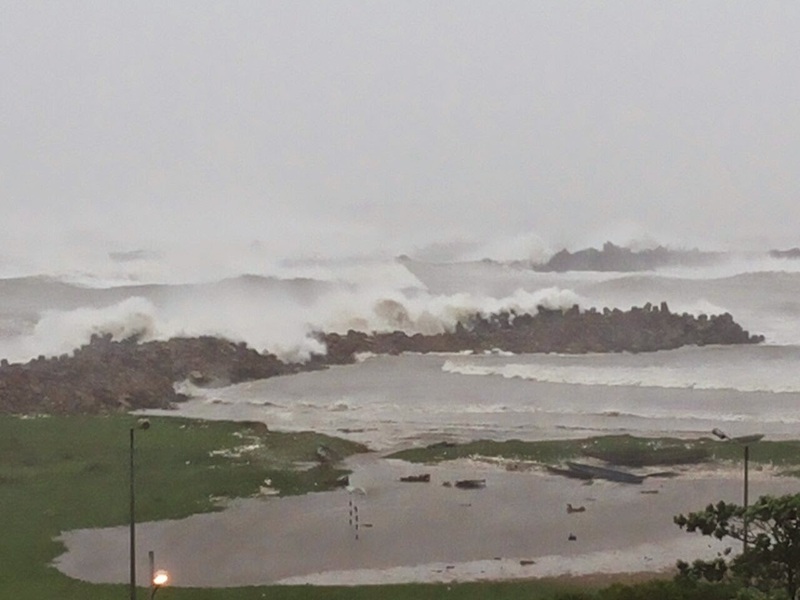 After the cyclone ‘Hudhud’ struck the northern coast of Andhra Pradesh near Visakhapatnam today afternoon, the Armed Forces have repositioned their assets and waiting for the civil administration’s directions to launch rescue and relief operations in the cyclone affected regions of Andhra Pradesh and Odisha. In the meantime, Andhra Sub Area of Army has deployed four teams of its personnel at Vishakhapatnam and four teams at Srikakulam (Tikli and Echerla). 300 Life Jackets, 12 Bauts, four Baps and eight OBMs are provided to them. Army has established a Disaster Management Cell at Air Defence College, Gopalpur. Six teams and ten Sub teams have been deployed for Road Opening Party and launching rescue and relief operations at Gopalpur. Army has also kept 25 rescue teams and two Engineer Task Forces on standby at Ranchi, Allahabad and Secunderabad. Indian Navy has also positioned its assets and personnel in some of the important areas of Odisha and Andhra Pradesh including Chilka and Vishakhapatnam, for relief and rescue operation, which will be coordinated by Naval Officer-in-Charge, Odisha and Naval Officer-in-Charge Andhra Pradesh, respectively. It has kept 30 diving teams with Gemini craft and associated equipment, 20 rescue teams, four ships with Medical Bricks and medical stores, six helicopters and two fixed winged aircrafts and two medical teams ready at Vishakhapatnam for undertaking rescue and relief operations. Indian Air Force has already geared itself up to undertake relief, rescue and rehabilitation operations as and when required. To bolster the transport efforts, IAF has kept one IL-76, one C-17 and five AN-32 aircraft ready at Chandigarh, Delhi, Jorhat and Agra. Keeping the rescue operations in mind it has kept in standby mode three Chetak at Hakimpet, one Medium Light Helicopter (Mi-8) at Yelahanka and ten Medium Light Helicopters (Mi-17) at Nagpur, Hyderabad, Kalaikunda, Suratgarh, Bagdogra and Barrackpore. Indian Coast Guard has also deployed 17 ships, two Air Cushion Vessels (ACVs) and 13 aircraft in Eastern and North-Eastern regions to augment the rescue and relief operations, wherever required. Out of 17 ships, six ships and five aircraft have been stationed at Chennai, three ships at Kakinada, three at Vishakhapatnam, four ships at Paradip, one ship, two ACVs and four aircraft at Haldia and four aircraft at Kolkata. Three rescue teams of Indian Coast Guard are also kept on standby at Vishakhapatnam, Kakinada and Gopalpur. As the exact nature and magnitude of devastation is yet to emerge completely, the state authorities are now monitoring the route and velocity of the cyclone closely. The contour and the magnitude of relief operations by the armed forces in these two states will be shaped accordingly. INS Kalinga, North of Vishakhapatnam, between Vishakhapatnam and Bheemilipatnam today (12 Oct 14) at about 1130 hrs. The cyclone had been moving at a speed of approx 20 kmph with wind speeds of the order of 180 kmph. The winds reduced considerably as the eye of the storm passed over the region. However, the rainfall is likely to continue for next 24 hours. The Eastern Naval Command had been put on high alert to provide any assistance towards rescue and relief of affected persons. Towards this end the preparations made included readying ships, aircraft and diving teams. Indian Naval Ships Ranjit, Shivalik, Shakti and Airavat are ready to sail with relief material for 5000 personnel embarked onboard the ships. Additionally, four more ships have been kept ready for sailing at short notice for relief operations as required. Two Dornier fixed wing aircraft and six helicopters are also ready for deployment and one Long range Maritime Reconnaissance aircraft (P 8I) has also kept standby for carrying out damage assessment once the cyclone passes and wind speeds reduce. In the meantime naval diving teams have been deployed in and around Vishakhapatnam for carrying out rescue and relief operations. As many as 14 diving teams have been deployed to Srikakulam, Ankapalle, and around Vizag. Additional 30 teams are ready for deployment at short notice as required. In addition approximately 250 NDRF and 300 Army troops have been deployed in/ around Visakhapatnam. Army columns have also been deployed in North Andhra at Achutapuram, Palasa and at Etcherla. The IAF has provided a mobile communication team as part of the contingency preparedness procedure. The IAF mobile communication team has been kept standby at INS Circars. The naval base at Vishakhapatnam has seen some storm damage with approximately 30-40% trees uprooted inside Naval Station and some naval installations on Dolphin Hill have suffered damage.